I don't normally use any tools to blog for Digital Alchemy, but recently I've been trying out various blog editors. The one I'm mainly using nowadays is Windows Live Writer, which is a full-featured editor from Microsoft with a slick interface and useful features like pinging, tagging, and table editing. One neat, but useless, feature is the ability to change the color scheme of the editor using the somewhat hidden colorize button (located next to the help button). However, one really helpful feature that's missing is the ability to upload images directly to Blogger (blogspot.com) blogs and other platforms that don't support FTP or the newMediaObject API. There's the useful Flickr4Writer plugin that lets you insert images from Flickr accounts, but you need to separately upload photos to Flickr first. This is where the Picture Post plugin comes in handy. Although you still can't upload images to Blogger, you can instead upload an image directly to your Flickr account and have it inserted into the body of your post. It's a seamless process so you never have to leave Live Writer. Once you install it, you can access the plugin by selecting Insert->Picture Post. 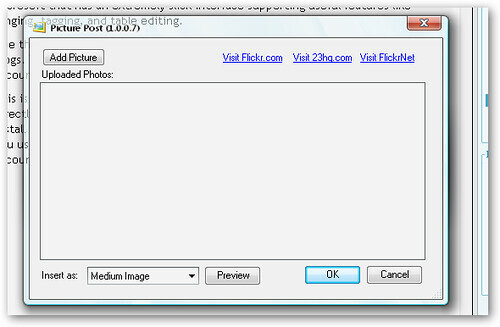 The first time you use it you'll need to authenticate the plugin so it can access your Flickr account.